Learn how to completely stop all of your dog's behavior problems and cut your training time in half with new techniques that give immediate results! Dogs are always learning, and are among the smartest animals in the world…but it's not uncommon for dogs to develop bad habits. Even if your dog is well mannered most of the time, disobedience every once and a while can cause embarrassment and frustration. If you have a dog that has developed bad habits, challenges you, or has obedience problems, then you've come to the right place. Here you will learn the correct way to train your dog so they will become controllable, learn good habits, and be obedient. In just minutes a day you will be able to completely transform your dog's behavior, totally eliminating all of your dog's obedience problems. We give you extremely easy to follow step-by-step instructions, which show you how to properly train any dog or puppy. Our techniques have worked on all breeds of dogs and works with young dogs as well as old dogs. Train adult full-grown dogs as well as puppies, there's no dog too old to be taught or trained. Learn how to instantly fix behavior problems and bad habits. Use the easiest and most effective ways to train your dog using safe fail-proof methods. Teach your dog tricks and other enjoyable commands. Have You Been Incorrectly Training Your Dog? Have you ever wondered how other people or dog trainers on TV can teach any dog a trick within five minutes when it takes your dog forever to half-learn one command? There's no secret to it, it's simply because the dog trainers know how to get the dog to understand what they want. If you're not properly training your dog with the correct methods, you could be confusing him or even encouraging bad habits without even knowing it! But if you're correctly training your dog, you can see results immediately! If you have to repeat the command before your dog obeys you. When your dog does the wrong trick or action for one or more commands. If your dog is only obedient when you are with them. If your dog only listens to certain people and ignores others. When your dog only obeys you when you have treats or food. If you've had to re-teach your dog the same trick or command. If any of the above statements are true for you, then you've made several mistakes when you were training your dog. Ideally, dogs quickly realize what they're doing wrong, but even the smartest dogs can become confused with the wrong training methods. Dogs think and learn very differently from you and I, which makes using the right training techniques vital in dog training success. It is very easy even for people with more than average dog training knowledge to confuse their dog when teaching easy commands or tricks. Are their other people around you and the dog when you're teaching tricks - Other people can distract the dog from focusing on the trick. Do you say any words besides your dog's name and the command - Even the phrase "Come on Spike, sit down" would be very confusing to dogs, because they would hear the commands "come", "sit", "down" and their name all in the same sentence. Do you show your dog a treat before you say the command - As soon as your dog sees a treat, he will not stop focusing on it. Don't take a treat out until your ready for your dog to eat it. Do you change body positions or move your hands when your telling your dog a command - Unless you're in the same body position and moving your hands the same way each time, your dog will think it is a new command. Our dog training techniques will quickly show you how to avoid and overcome every training error. You will be amazed at the dramatic changes in your dog's behavior and at the noticeable increased intelligence when training is clear and fun! "I Thought I Would Never Stop Apollo from Barking"
"I wanted to thank you for your amazing guide. My husband and I were at our ropes end with our dog Apollo and his barking problems. He would bark at sounds on the tv, people walking on the street, birds on our deck, and just about everything else. I thought I would never stop Apollo from barking...that is until I found your website. After we started implementing your instructions we saw immediate results." "Everest No Longer Jumps on People"
"Our 95 pound rhodesian ridgeback, Everest, had a horrible problem of jumping on myself and anyone else who went outside to see him. It got to the point where no one wanted to go outside, especially if it had been raining. Thanks to your guide Everest no longer jumps on people. It only took a few sessions and now Everest sits whenever anyone goes outside to see him. He now knows that when he sits he get attention and he and I both love it." Quickly learn all the techniques, tips, and tricks needed to transform your dog's behavior problems for good. Finally, stop bad behavior problems and turn bad habits into good habits. Barking All The Time - Is your dog constantly barking? Learn the quickest way to stop this annoying habit! Digging In Your Yard - Learn the easiest and most effective way to stop your dog from destroying your yard! Jumping Up On People - Learn the fastest way to teach your dog to stop jumping on everyone they see! Escaping - Does your dog always seem to find a way to escape or run away from his pen or house? Learn how to stop this frustrating and dangerous habit! Constantly Whining - Does your dog whine for food or whenever he/she is put up? Finally, be able to stop this! Going to the Bathroom Inside - Finally be able to teach your dog to stop this habit. It doesn't matter how old your dog is! Pulling On the Leash - Do you feel like your dog walked you when you get back from walking your dog? Learn how to teach your dog to stop pulling on the leash! Chewing On Everything - Finally, be able to stop your dog from chewing on and destroying everything you own! Harassing Cats - Do you or a neighbor have a cat that is constantly being harassed by your dog? Learn how to stop this! Fighting Other Dogs - Is your dog aggressive towards other dogs, or has a bad habit of fighting other dogs? Learn how to stop this dangerous habit! Biting People - Does your dog nip or bite at other people? Learn how to stop this scary habit! Eating Feces - Does your dog eat feces? Learn how to stop this disgusting habit! Running Out the Door - Does your dog bolt out the door as soon as it is opened? Finally, be able to stop this! Have A Bad Temper - Does your dog have a bad temper? Learn how to control and stop your dog's temper problems! Scared of Loud Noises - Does your dog get scared by loud noises? Learn what's causing this and how to stop it! Pulling Out Their Hair - Is your dog pulling out his/her hair? Learn what's wrong, and how to stop this! Biting Himself/Herself - Does your dog always seem to have a spot where he/she is constantly biting or nipping himself/herself? Learn exactly what to do to stop this! Proper Training Techniques - Learn the proper and correct training techniques so your dog will clearly understand commands and enjoy learning new ones. Over 10 Fun Tricks for Your Dog - Learn over 10 tricks both you and your dog will love. Including sit, stay, come, fetch, stop, shake, speak, kiss, lie down, and more. Facts on Over 24 Popular Dog Breeds - Learn facts on the most popular dogs, including how to groom, exercise, and of course their ease of training by breed. The Commands To Have Complete Control Over Your Dog - Discover a few simple commands that, when used properly, allow you to have complete control in every situation. Quick Steps to Each Command - Easily browse over the required steps to training your dog with our quick step checklist at the bottom of each trick and command. What Not to Do - Learn how to avoid confusing your dog with the "What Not to Do" section beneath each command. Once you learn the correct way to train your dog, you will notice dramatic changes in their behavior problems immediately. Not only will these techniques change your dog's behavior but they are safe, fun, and do not require any past knowledge of dog training. It doesn't matter what type of dog you have, these powerful training techniques have worked with every breed of dog. All of our dog training tips and techniques are safe, non-violent, positive training which not only gives your dog a better attitude, but they learn much faster too. 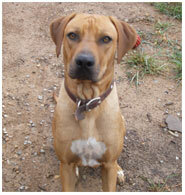 Unlike other guides, we do not use choke collars or any other additional dog training equipment. All you need is your dog, a few dog treats, and the instructions in this guide. There is no past knowledge of dog training required because we give you all the information you need in an easy to follow downloadable guide. If you want to solve your dog's behavior problems and have a well mannered trained dog, you have to take action... Your dog is not going to change it's behavior and correct it's bad habits unless you do something. Hire a professional dog trainer or enroll your dog in a dog training course. It will be expensive...don't believe me? Pick up your phone and call around. You'll find that the cheapest class will be $100-$120 for 8 sessions where you will have one teacher with 15 other dogs, a private dog trainer charges $30 to $100 per hour, and the least expensive boarding school is $950 for two weeks! Wait and hope your dog's behavior will change. Unfortunately, this won't happen and never has happened. If anything your dog will have less energy as he gets older, but your dog will never develop good behavior and become obedient without you or someone teaching him. Search the internet for solutions. We did this before we had this site built, and our mouths dropped open when we saw some of the things people with no experience openly shared with others on training dogs. Even the best dog training tips we found were lacking a few simple, but important, directions vital to dog training success. There is a quick and easy way to train your dog that works 100% of the time and has worked for hundreds of people in the same exact situation as yourself. Dog Trainer Pro contains the step-by-step instructions on how to solve your dog obedience problems and teach your dog tricks. In as little as 5 minutes from now you can be on your way to having a well trained, better behaved, obedient dog! If you're ready to have a trained dog with great behavior and never have to worry about your dog's behavior ever again, then take advantage of Dog Trainer Pro's easy, step-by-step, risk-free solution to solving your dog's behavior problems. We 100% Guarantee that you WILL see a change in your dog's behavior, so you have nothing to lose. 60 Days from now you will have a fully trained obedient dog, or you will have your money back. Midnight and the price is only $27.98!!! P. S. Remember, Dog Trainer Pro comes with a full 60 day money back guarantee so you have 8 solid weeks to see a complete difference in your dog's behavior and if you're unsatisfied in any way we will give you a full refund with no questions asked. 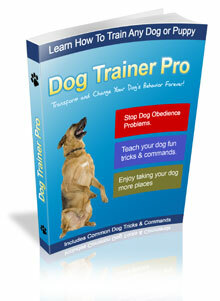 Dog Trainer Pro for $27.98 While the Offer Lasts! After you order Dog Trainer Pro you will have immediate access to all the dog training techniques you need to train your dog! Once you click to download/order Dog Trainer Pro you will be taken to our secure online order form. 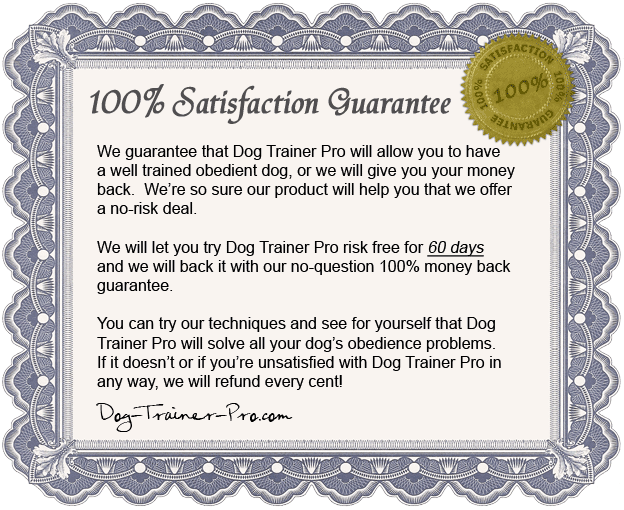 After you complete the order form you will be taken to our secure download page where you can download Dog Trainer Pro in .pdf format or you can print Dog Trainer Pro online.